For the past two years, I've been honoured to be Fortismere School's Patron Of Reading. This is a fantastic scheme where an author develops a special relationship with a school, and visits many times to help spread the love of reading. I was invited to do this by Fortismere's fabulous librarian Gill Ward, and you can read about all the work we've been doing here. This month saw my final day at Fortismere. First of all, I had lunch with a creative writing group of Year 7s and Year 8s, where we looked at the stories they'd been working on. I was really impressed with the standard of writing – I think there are definitely some future authors here! Then I did a creative writing workshop with a Year 8 class, in which I asked them to write stories they would want to read themselves, and worked with them through the processes of having an idea, writing a first draft, and then editing it. They produced some fantastic work in just one hour – stories that showed real imagination and craft. I then spent some very enjoyable time with Fortismere's Carnegie Shadowing Group. 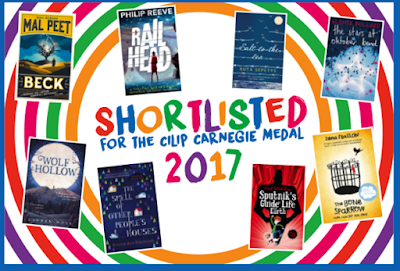 They are part of the amazing Shadowing Scheme run by the CILIP Carnegie & Kate Greenaway Children's Book Awards. 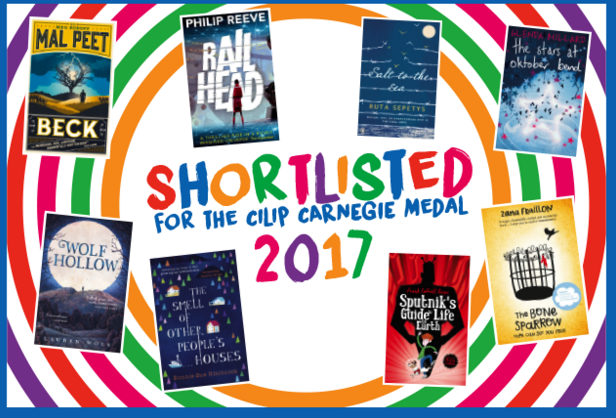 They read all the books on the Carnegie Medal shortlist, and write reviews of them online. We had a really fascinating, open, honest discussion about the books on this year's shortlist. It was amazing to see there was at least one person who loved every book – and at least one person who didn't! Things that work for one reader don't necessarily work for another. But this year, it's fair to say that the majority of Fortismere Shadowers agreed with the judges that Salt To The Sea by Ruta Sepetys was the outstanding book. Finally, my last event as Fortismere Patron Of Reading was the Reading Champions evening. The idea of Reading Champions began at the very beginning of my time at Fortismere, when I suggested that it would be great to see young readers recommending their favourite books to each other. So all through the year, Fortismere Year 7s have been making presentations championing their favourite books, and this evening saw the very best of them competing in the final! They made terrific cases for books including Wonder by RJ Palacio, One by Sarah Crossan, White Fang by Jack London, Mortal Engines by Philip Reeve, Five Children On The Western Front by Kate Saunders, Geek Girl by Holly Smale, How I Live Now by Meg Rosoff, Inkheart by Cornelia Funke, and The Enemy by Charlie Higson. It was amazing to see how passionate they were about their favourite books, and how imaginative they were in making their presentations. For a writer, there could be nothing more inspiring to witness – so I'd like to end my final blog with a big THANK YOU to all the young readers and writers I've been working with for the past two years, to all their parents and teachers, and to their fantastic librarian for inviting me to do this work: it's been brilliant!